A pilot of an all-in-one government website could give an early indication of the government's digital strategy with agile software development techniques, crowdsourcing and cloud computing. 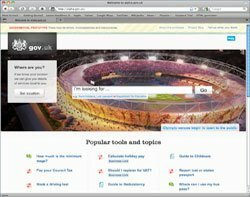 Alpha.gov.uk is a pilot for a website that could put all UK government digital services and websites on one URL. This early version of a potential government website is now available for citizens to test and comment on (click here). The project began after digital champion Martha Lane Fox gave the government her report on its digital services. She recommended all government digital services should be under a single URL. "The user should not have to navigate the departmental structure of government before finding the service or content they need. On the web, this implies the adoption of a single internet domain for central government," she reported (see Martha Lane Fox's recommendations below). The pilot website, hosted on Amazon's cloud, was developed in-house using agile software development techniques to involve users early in the project. The site will go through two months of testing by UK citizens through crowdsourcing to enable future users to give their views on usability. This approach is widely used in the software industry to get customer feedback on a new version of a product months before the finished product ships. The testing will help the team meet its main objective of improving user experience. "We were set the challenge of shifting all government websites to a single domain while being user-sensitive. The best way to do this is to build a very early prototype and get real feedback from real people," said Tom Loosemore, deputy director of the Cabinet Office's Single Government Website development team. Making a government service "so good that you want to tell your friends about it" is the Holy Grail, according to Tom Loosemore. The project is using Google search technology to make sure it focuses on what the customers actually want, rather than what the government thinks they want. Loosemore says 95% of government website visitors arrive via searches. It was critical to carry out search and site analytics across .gov.uk. Members of the development team came up with the top 100 needs expressed through searches, (which they wrote on postcards and hung around the office - pictured). These included questions such as: "I need a new passport?" and "What is the minimum salary?" Although creating an attractive user experience is the main aim the cost savings are significant. Moving all government websites to one place will cut government publishing costs, currently £130m, by an estimated 50%. The UK government is renowned for handing huge projects like this to IT outsourcing suppliers - most are either fully run by suppliers or were developed by them. These contracts are often inflexible, regularly fail to deliver and often run over cost. The blame often lies partly with the government, because it doesn't always know what it wants. Suppliers are often accused of supplying what they think is best and not what the government wants. Loosemore came from the private sector and admits the public sector is much tougher, because of the importance of getting it right. He says there is a shortage of software developers working in government because of the reliance on suppliers. The Alpha.gov.uk project had to use contractors to boost its development skills. Loosemore says there should be more software developers in government. This will ensure thay use the best techniques, rather than rely on the prefered techniques of suppliers. The methods being used by this team are more like the dynamic developments of an IT start-up. Using the cloud to host the pilot saves money, doing it in-house negates the need to sign a lengthy contract with a supplier. Having all the team in one place ensures the project remains on course, while the agile software development technique to ensure flexibility. If the pilot, which cost £261,000 to build and run, becomes more than that and is rolled out, its practices could become more widely used in government. Robin Paine, who was CTO at the London Stock Exchange during its project to replace its core trading software with a system known as Tradelect, says the methods being used are now mature and, as a result, the government has access to a large number of techniques. "Capabilities such as the Amazon cloud and Google search have been around years and have been tested around the world," he added. He says like most other projects the aim will be to increase accessibility, lower costs and improve quality and that he supports the government using these techniques to achieve this. A project featuring Amazon Web Services, Google and crowdsourcing sounds more like something going on in a garage on the outskirts of Silicon Valley, but there is a team holed up in South London using these techniques as part of a project that could drastically change how we interact with government and transform how the government carries out software development projects. But if the government is to make the best use of the large number of development techniques available it needs to bring the right skills into government. Make Directgov the government front end for all departments' transactional online services to citizens and business, with the teeth to mandate cross-government solutions, set standards and force departments to improve citizens' experience of key transactions. Make Directgov a wholesaler as well as the retail shop front for government services and content by mandating the development and opening-up of application programme interfaces (APIs) to third parties. Change the model of government online publishing, by putting a new central team in Cabinet Office in absolute control of the overall user experience across all digital channels, commissioning all government online information from other departments. Appoint a new CEO for digital in the Cabinet Office with absolute authority over the user experience across all government online services (websites and APIs) and the power to direct all government online spending.